Year Twelve English Wednesday Double Lesson. 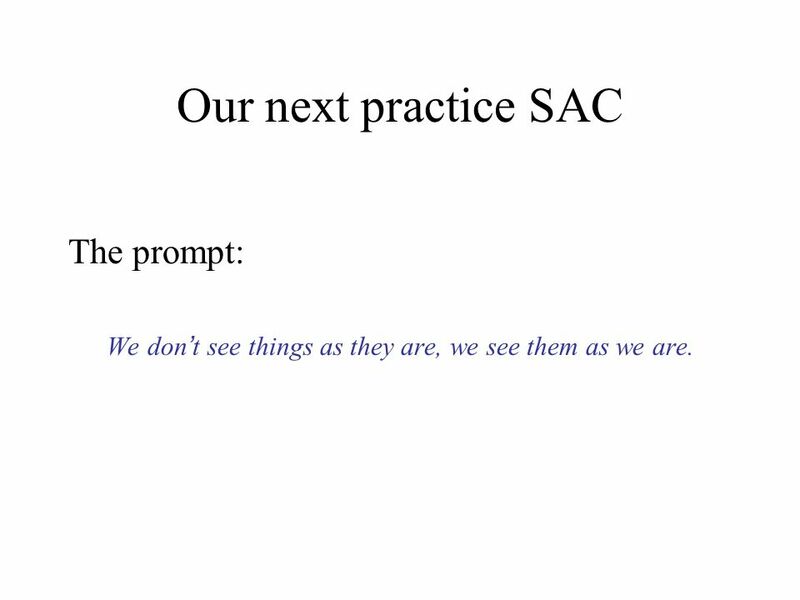 Our next practice SAC The prompt: We don t see things as they are, we see them as we are. 2 Our next practice SAC The prompt: We don t see things as they are, we see them as we are. 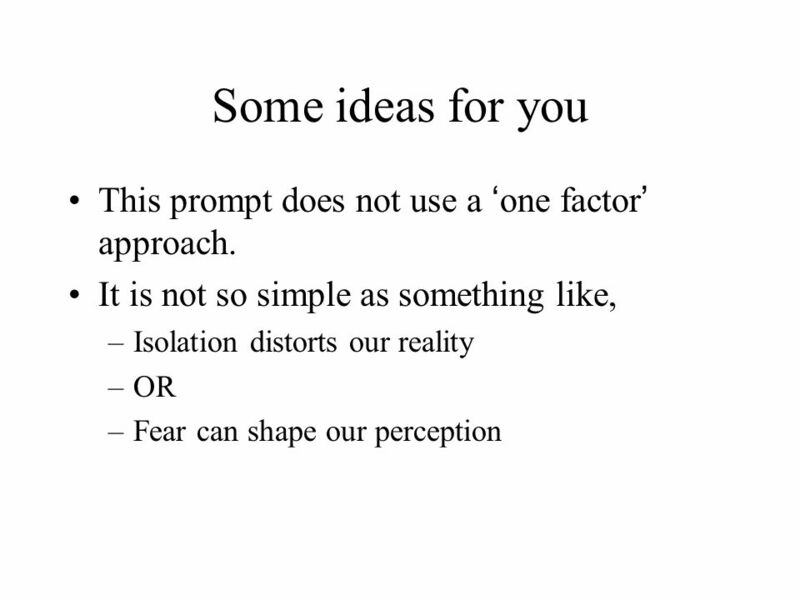 3 What is your perception of this prompt? These were some ideas from yesterday…. 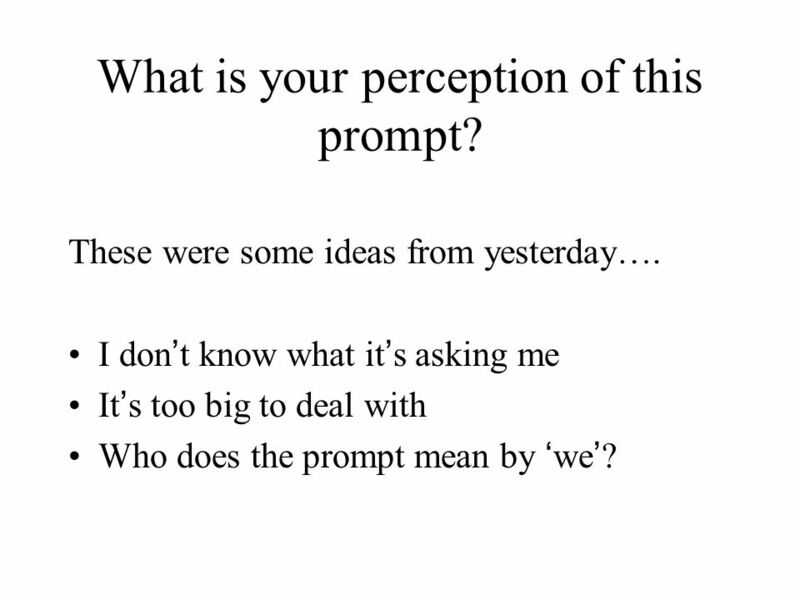 I don t know what it s asking me It s too big to deal with Who does the prompt mean by we ? 5 So what can you do? 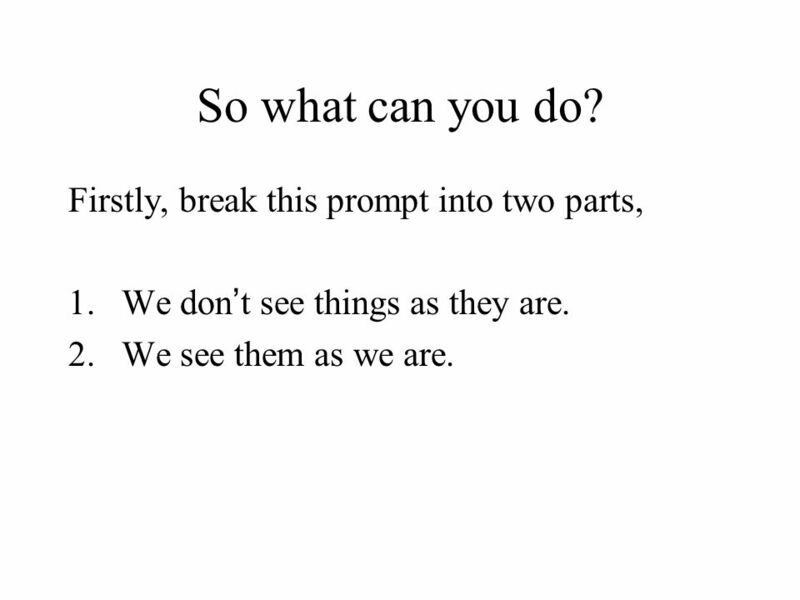 Firstly, break this prompt into two parts, 1.We don t see things as they are. 2.We see them as we are. 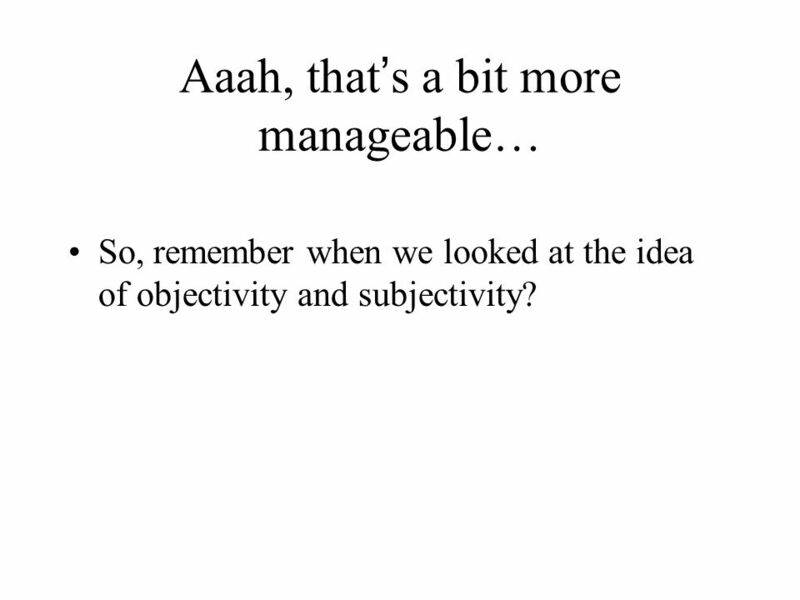 6 Aaah, that s a bit more manageable… So, remember when we looked at the idea of objectivity and subjectivity? 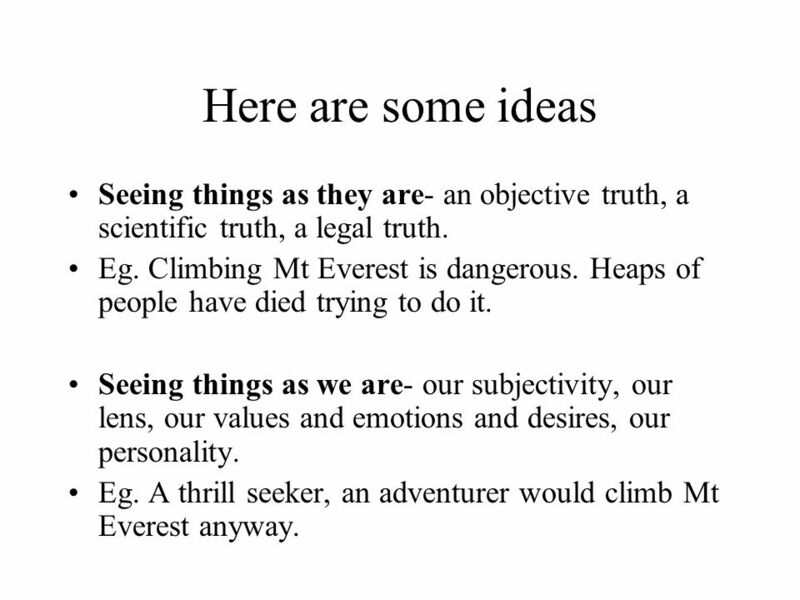 7 Here are some ideas Seeing things as they are- an objective truth, a scientific truth, a legal truth. Eg. Climbing Mt Everest is dangerous. Heaps of people have died trying to do it. Seeing things as we are- our subjectivity, our lens, our values and emotions and desires, our personality. Eg. A thrill seeker, an adventurer would climb Mt Everest anyway. 8 Idea from The Shark Net? 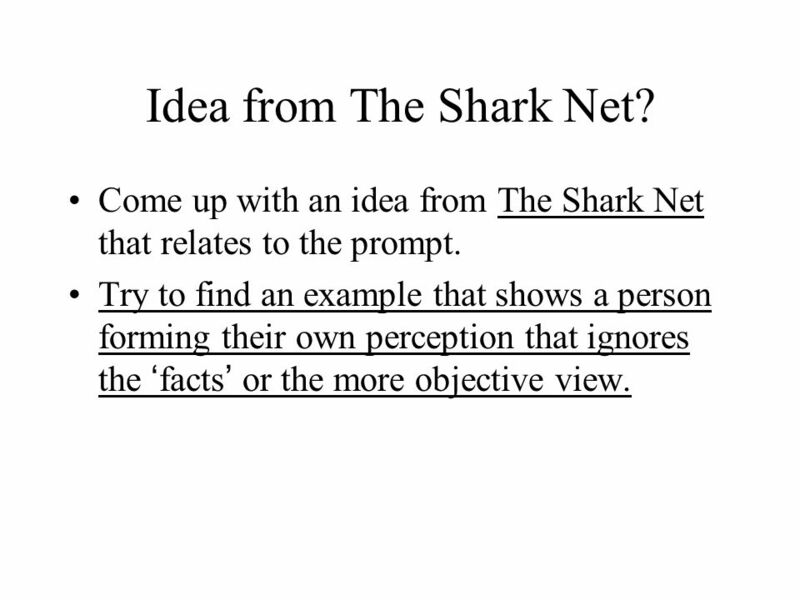 Come up with an idea from The Shark Net that relates to the prompt. Try to find an example that shows a person forming their own perception that ignores the facts or the more objective view. 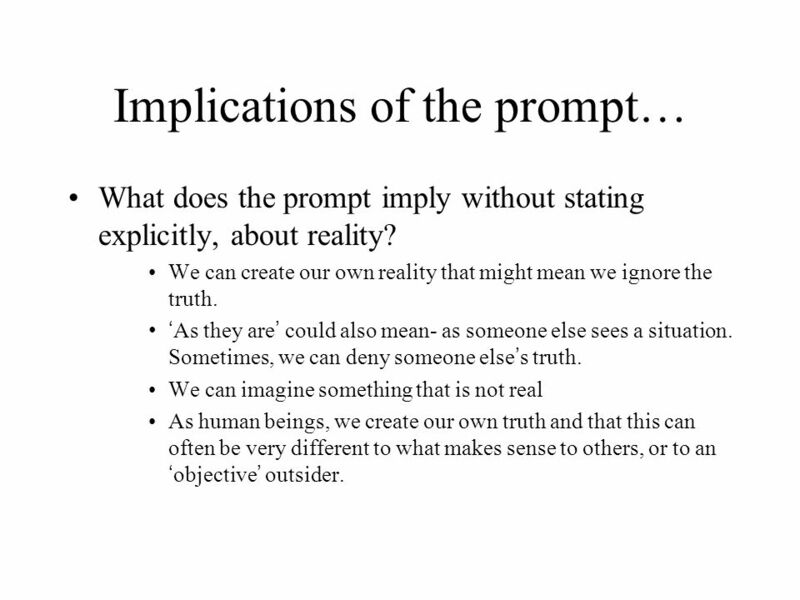 9 Implications of the prompt… What does the prompt imply without stating explicitly, about reality? We can create our own reality that might mean we ignore the truth. As they are could also mean- as someone else sees a situation. Sometimes, we can deny someone else s truth. We can imagine something that is not real As human beings, we create our own truth and that this can often be very different to what makes sense to others, or to an objective outsider. 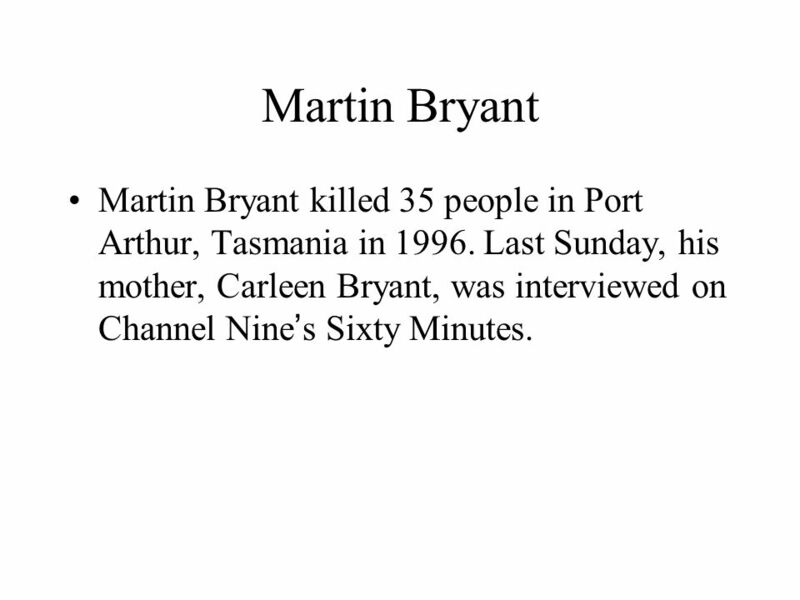 10 Martin Bryant Martin Bryant killed 35 people in Port Arthur, Tasmania in 1996. Last Sunday, his mother, Carleen Bryant, was interviewed on Channel Nine s Sixty Minutes. 11 After viewing http://sixtyminutes.ninemsn.com.au/stories/ 8216486/a-mothers-burdenhttp://sixtyminutes.ninemsn.com.au/stories/ 8216486/a-mothers-burden How could you connect this interview with the prompt? 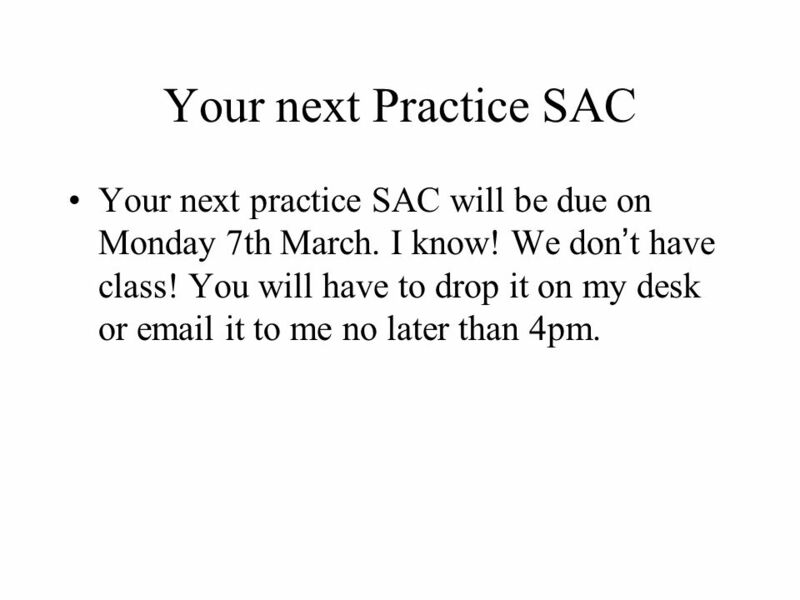 12 Your next Practice SAC Your next practice SAC will be due on Monday 7th March. I know! We don t have class! You will have to drop it on my desk or email it to me no later than 4pm. 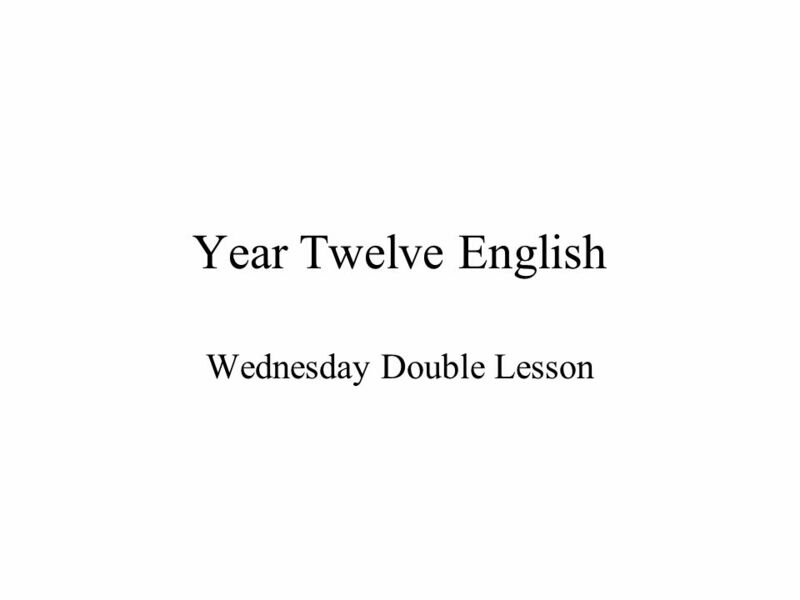 Download ppt "Year Twelve English Wednesday Double Lesson. Our next practice SAC The prompt: We don t see things as they are, we see them as we are." Whose Reality? Lesson Objective: Students will explore the concept of denial and how it changed and distorts reality. Starter From what you learnt last lesson, summarise the Allegory of the Cave in 5 bullet points. The idea of morality as a social contract offers an explanation of why its reasonable to act in accordance with the dictates of morality As such it provides. I feared being alone, Until I learned to like myself. Writing a fable. 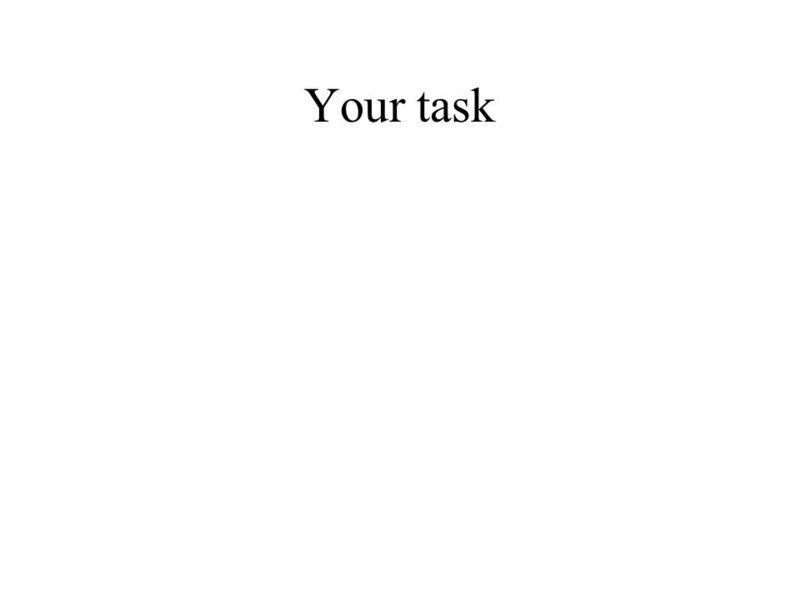 You are going to write a fable today. Do you remember the parts of a fable? Just4English.com Paragraphs Part One Golden Rules. Types of Memory: EQ: What are the types of memory and how do they help us remember? Lesson 4: Percentage of Amounts. Tosspon- Global Communication UNO IPD - Meeting 7 Agenda Building Business Relationships Probing Questions.